I naturally wake up very early and like to have lots of time alone to write and process before the day starts. My clearest ideas come before I'm fully awake, so I tend to push any kind of caffeine back until it's necessary. I usually can't remember my dreams upon waking, so I like to imagine that the authentic feelings that come after waking up are still connected to my dreams. My thought patterns are usually much more forgiving and lighthearted than later in the day. Home life is extremely important to me so I'll also take a lot of time on the backend of mornings to do all my little self-imposed chores, which more or less involve caring for all the plants, my cat, cleaning, organizing, and making it nice. Simple domestic tasks give me so much satisfaction. With the unpredictable way my day-to-day has been for such a long time, caring for myself and my home at the top of each day feels really important. My art background is broad but stays connected by performance and vulnerability. I moved to New York after high school as an opera singer who had no idea what it would look like to practice full-time in the classical world. I didn't go to a traditional program of any kind, so if something I was studying didn't feel right, I didn't have a whole lot of incentive to keep pushing. I think that's one of the greatest gifts my move gave me early on. It was the ability to look into different modalities while juggling the practical ways to make a living and making judgement calls in terms of how I structure my time, like if a voice lesson is worth the financial investment. Looking way back, I think I overcompensated because of my decision to not study through college. I was searching for validation within the performance and art world here, which is obviously very difficult and very psychologically tricky, especially when you're so young, but I survived. I keep two book-shelving systems in my house: one with books I've decided to hold on to but don't reference super often and another small shelf in my bedroom for ongoing reminders and inspiration. All of these sit atop the bedroom shelf. I have two Merce Cunningham books. 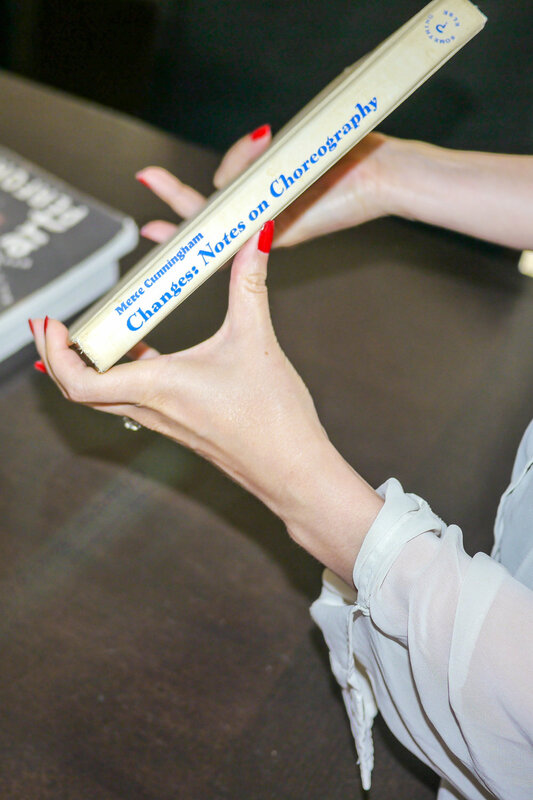 Changes: Notes on Choreography is a look into the working notebooks of Cunningham. You’re able to read through the ways Cunningham sees an issue within certain work and follow how that issue is lifted through the different notes and choreography sketches. Art Performs Life is a fun play-by-play on the lives of two personal heroes, Meredith Monk and Bill Jones. I very much dislike the title of Oh She Glows by Angela Liddon, but it is an incredible resource for vegan, gluten free, raw, wholesome and delicious foods. I file Moonwalking With Einstein by Joshua Foer under participatory journalism. It follows Foer while he takes on a sporadic enrollment into a U.S. Memory Championship with only one year to prepare. I do a lot of stuff that could be filed under self-care and therapy, like massages, facials, hair and nail appointments, psychotherapy twice a week, lots of walking, and basic "me-time" stuff. There's a really inconspicuous massage place on Grand and Metropolitan Ave, right off the L train, labeled "Foot and Back" that is really great for cheap massages. Heyday is cool for affordable facials. I recommend Marjorie Wilson there. Brooklyn Psychotherapy on Wilson Ave in Bushwick is fantastic. They really want to make it work with you no matter your financial or insurance situation. I try to eat a mostly vegan diet with lots of fresh, whole foods and drink plenty of water. At this point in my life, a good sleep and diet seem to sustain me enough, which feels good and isn't something I take for granted. I do take supplements that were recommended by my naturopath after doing some blood-work and research, but besides that, I don't have a strict regimen of any kind. Klaire Labs make a great gluten and casein-free multi and probiotic. I do a D3 vitamin in the fall and winter, which I swear leaves me feeling less susceptible to seasonal depression. Cutting down to little or no coffee was really good for my mind, but everyone is different. Umcka is brilliant if you think you're catching a cold or feel susceptible to one. It's meant to shorten the duration of sickness, but I use it as a preventative and that seems to work really well. I swear by this stuff and always have a bottle of it when I tour. Everyday Oil is incredible. I use this all the time as a moisturizer and the smell is super balanced and pretty. I really like that Marvis toothpaste. I use the whitening one and it works really, really well. I cover my skin in coconut oil on the daily. I clear my mind and wash off my body. I like to make the room smell nice with some Palo Santo, avoid screens, and get in some reading. If I'm feeling any stress for the next day, I'll write a list or jot down my feelings in a notebook to give myself permission to check-out for the day. I love nighttime teas, especially bedtime tea from Yogi.